"The Best Golf and Dining on West Lake Okoboji"
Okoboji View Golf Course was built and opened for play in 1962. The Schnell Brothers of Milford, Iowa purchased the course in 2005 and have worked tirelessly to transform the 18-hole layout into a memorable golfing experience for their customers. In the last few years, the golf course has gone through a major overhaul, incorporating a watershed that has added to its beauty as well as benefitting the water quality flowing into West Lake Okoboji. Curt and his wife Bennie are the club managers. Curt is the Head PGA Professional and has been a member of the PGA since 1988. He has also been named one of the top 100 teaching pros in the country, according to Golf Magazine. He owns the course record at Okoboji View with a 61 and still plays competitively in the Iowa PGA Section events. Curt has been a 4-time Player of the Year in Iowa and Nebraska, as well as 4-Time Teacher of the Year in Iowa and Nebraska. And in 2015 was inducted into the Iowa Golf Association Hall of Fame. Bennie oversees the golf shop, keeps track of league play five nights a week and lends her skills to the culinary side of the operation. Steve is the Golf Course Superintendent and his wife Tracy, a CPA, oversees the financial side of the business. Steve has been a golf course superintendent since 1983 working at Okoboji View while in high school and served as Head Golf Course Superintendent at Sioux City Country Club for 10 years and Hillcrest Country Club in Yankton, SD for 12 years. Steve's eye for detail shows throughout his well-manicured course. Okoboji View, a public course with membership availability, is a beautiful golf course with an emphasis on nature. It offers many challenges with fast greens, beautiful water features, tree lined fairways and rolling hills. 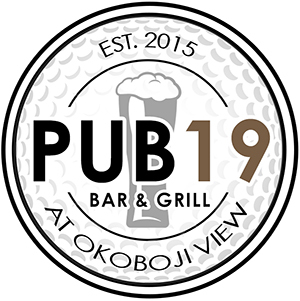 The newly remodeled restaurant and bar - renamed Pub19 Bar & Grill in 2015 - is full service and you can enjoy drinks and dining on our large new deck overlooking the golf course. Restaurant Manager, Kevin Goodwin can be found several nights a week grilling steaks on the deck "like no other in the lakes area". So, whether you need a golf lesson or a professional club-fitting, need to schedule your corporate golf outing, wedding rehearsal dinner/reception or class reunion, or just want to enjoy playing at one of the best courses in Northwest Iowa - Okoboji View Golf Course, a family run facility, is for you. We will treat you well! Here at Okoboji Golf Course we pride ourselves on the high quality of magnificent golf, superb amenities and outstanding service that we offer our valued customers. We have worked hard over the years to become a staple of the community, and in the process we have earned recognition as one of the region's premier golf experiences.